Minotaur-C, formerly known as Taurus, is an all-solid-fueled orbital launch vehicle operated commercially by Orbital ATK. The four-stage vehicle can lift up to 1,590 Kilograms into Low Earth Orbit and is largely based on Orbital’s air-launched Pegasus XL rocket – adding a Castor-120 as first stage (formally Stage 0) and eliminating the Pegasus rocket’s delta wing, stabilizers and aerosurfaces. The Taurus rocket made its debut in 1994 and has flown nine times over 17-year career, successfully completing six missions. Taurus was available in three different configurations including an ‘Air Force Taurus’ that used a TU-903 Stage 0 from the Peacekeeper under the Air Force’s Orbital Suborbital Program 3 that allows surplus missile stages to be used for government launches to create a more cost-effective solution than fully commercial launch vehicles. 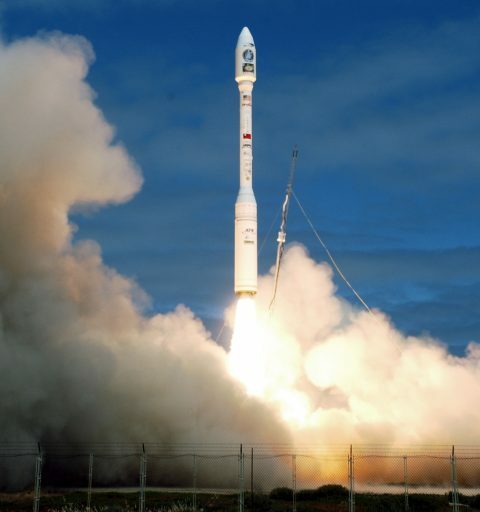 Taurus encountered three launch failures over its career, first in September 2001 when the rocket’s second stage lost control for a five-second period due to a temporary nozzle gimbal actuator drive shaft failure, causing the vehicle to expend performance when recovering attitude control and reaching a non-stable orbit – rendering the mission a complete loss. 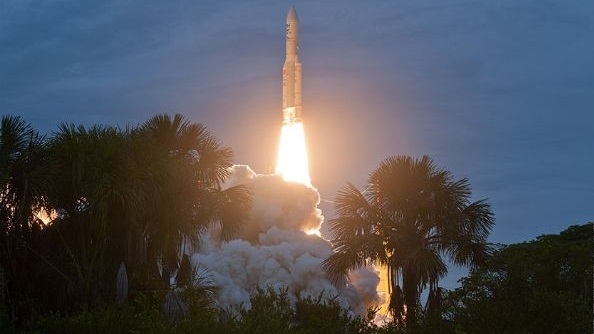 Two consecutive launch failures in 2009 and 2011 claimed NASA’s Orbiting Carbon Observatory and the Glory climate change monitoring satellite, corresponding to a financial loss in excess of $800 million. Both launches failed at the point of payload fairing separation with Taurus unable to shed its two fairing halves and carrying on with the extra weight of the clamshell-type fairing which prevented it from achieving orbit and re-entering the atmosphere less than 20 minutes after liftoff. 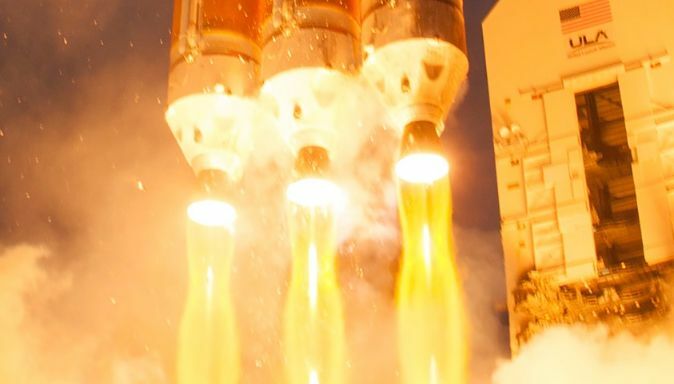 No definitive root cause for the fairing separation failure could be determined, though NASA conducted a four-month inquiry that identified four potential causes and corrective measures to improve the reliability of the payload fairing system. The recurrence of the fairing separation problem in 2011 despite corrective action taken by Orbital Sciences (now Orbital ATK) was a major blow to the Taurus program. Again, no definitive root cause could be determined by NASA’s Mishap Investigation Board that focused its analysis on a potential failure of a frangible rail to separate as a result of the rubber charge holder slumping due to acceleration encountered during launch or a failure of the rail system itself due to it operating outside its tested environment. The conclusion of Orbital’s own probe was that the frangible joint used on the 63″ fairing was not manufactured to aerospace requirements by a subcontractor to the original fairing contractor. The two back-to-back failures on high-profile NASA missions left the Taurus name with a significant black mark. 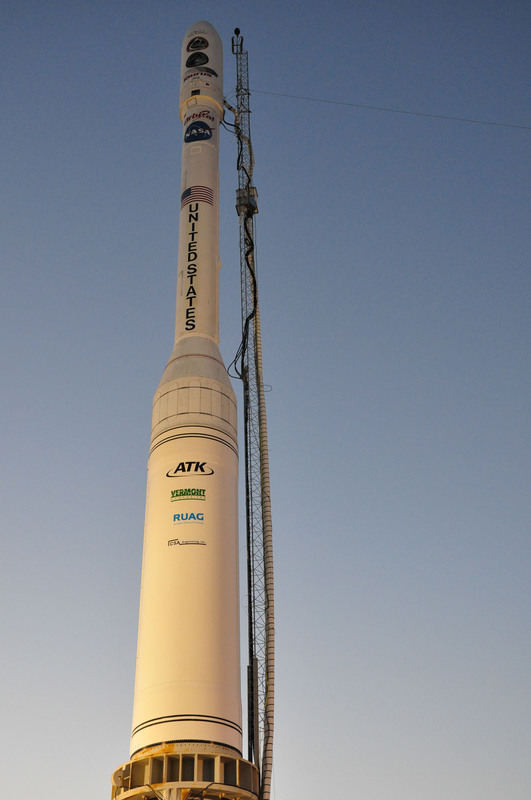 Orbital Sciences re-named their Taurus II to Antares in late 2011, likely in an effort to distance the separate launch vehicle program from Taurus since it shares no significant commonality with the troubled vehicle. The Taurus name was silently retired by Orbital ATK some time in 2014 in favor of the Minotaur-C designation. However, the transition from Taurus to Minotaur-C was not a pure re-branding as a number of upgrades occurred on the hardware side, most notably the change from the heritage avionics system to Orbital ATK’s MACH (Modular Avionics Hardware) that is intended to provide a single, flexible flight control solution for all Orbital ATK launch vehicles. Orbital ATK’s Minotaur-C is an all-solid-fueled launch vehicle comprising four stages and available in a number of different configurations to cater to each mission’s specific performance requirements. Minotaur-C stands up to 32 meters tall and has a launch mass of up to 77 metric tons when flying in its 3210 configuration. Minotaur-C can use two types of boost stages (Stage 0), an Orbital-ATK Castor 120 is employed by the standard and Minotaur-C XL variants while a government-furnished Peacekeeper stage (TU-903) is available for use on government-contracted missions to reduce launch cost. 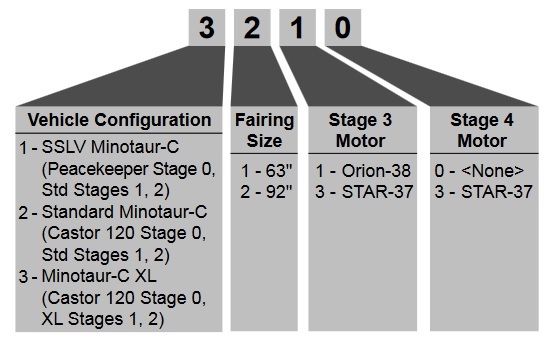 Stages 1 and 2 are Orion 50 Solid Rocket Motors either flying in their standard configuration or the larger XL versions, hence the Minotaur-C standard and XL designations. An Orion 38 or Star 37FM can take the role of fourth stage (formally Stage 3) depending on a mission’s performance requirements and a Star-37 Solid Rocket Motor can be added as upper stage for high-energy injections. Minotaur-C can lift up to 1,590 Kilograms into a 185-Kilometer reference orbit, 1,458kg into a 400km LEO (28.5°) and 1,054kg into Sun Synchronous Orbit when flying with the smaller 63-inch fairing; the 3210 version with the larger fairing can lift 1,278kg into a 400km LEO and 912kg into Sun Synchronous Orbit. Flying with five stages, the vehicle can lift 530 Kilograms onto an Earth Escape Trajectory. As an all-solid launcher, Minotaur-C only requires basic Ground Support Equipment which can be realized via transportable Launch Support Architecture and a simple, one-use fall-away umbilical. Minotaur-C can be operated from the U.S. Western Range, Eastern Range, NASA’s Wallops Flight Facility, the Kodiak Launch Complex in Alaska and the Reagan Test Site on Kwajalein. Castor 120 is a solid-fueled rocket motor for use as a first and second stage as well as strap-on booster. It has been designed using proven technology, primarily as a commercial-equivalent to the TU-903 Peacekeeper first stage. To date, Castor 120 has been employed as the first stage of Lockheed Martin’s Athena I and the second stage of the Athena II before being introduced on the Taurus project line. The SRB-A Solid Rocket Boosters on Japan’s H-IIA rocket were developed in a joint effort by ATK and IHI Aerospace and are largely based on the Castor 120 design. 120 refers to the planned weight of the booster in thousands of pounds when the project was first envisioned, but the final product turned out lighter. The Castor 120 version has a less aggressive thrust profile than the Peacekeeper first stage due to different needs for a ballistic missile that aims for maximum acceleration to make interception more difficult while a space launch vehicle carrying satellites has to maintain safe accelerations for the payload system, resulting in a lower average thrust but longer burn time to match the TU-903’s total impulse. Castor 120 is 2.34 meters in diameter and 9.02 meters long with an empty mass of under 4,120 Kilograms, capable of holding 48,949 Kilograms of HTPB-based solid propellant. The Castor 120 motor has a nozzle diameter of 1.52 meters, expanded for a specific impulse of 280 seconds. The baseline version of the Castor 120 calls for a peak thrust of 1,957 Kilonewtons and an average thrust of 1,686 Kilonewtons over a burn time of 79.4 seconds. Through modification of the propellant grain, the thrust profile can be tailored to provide a reduction in thrust around the time of Maximum Dynamic Pressure or for a regressive thrust to reduce acceleration towards the end of the Castor 120 burn. Control is provided by a cold-gas thrust vector control system capable of moving the nozzle by 5.5 degrees in any direction. A Castor 120XL version has been developed and qualified by Orbital ATK to further enhance the performance of the Minotaur product line. In addition to stretching the motor case, the XL version also implements improved manufacturing techniques and materials including an electro-mechanical thrust vector control system using thermal batteries. The Castor 120XL stage is 59 centimeters longer than its predecessor with an empty mass of 4,168 Kilograms and a propellant capacity of 51,798 Kilograms. It is baselined for a maximum thrust of 2,040 kN and an average thrust of 1,698 Kilonewtons over a burn time of 83.5 seconds. Orion 50 ST and Orion 50S XLT are part of the Orion 50 series produced by Orbital ATK and originally developed for the air-launched Pegasus rocket which first flew in 1990. The original Orion 50 stages, designated Orion 50S and Orion 50T were designed for the Pegasus first and second stage with the first stage using steering fins for three-axis control while flying through the atmosphere and the 50S version using a Thrust Vector Control System. The next addition to the Orion 50 family was the 50 S XL version, a stretched version for the Pegasus XL launch vehicle to increase overall performance. The Orion 50ST version used on the Minotaur-C rocket strips the Orion 50S of its wing and aerosurfaces and adds a Thrust Vector Control system instead with the Orion 50S XLT representing an adapted version of the Orion 50S XL. All Orion 50 stages employ a solid propellant mixture consisting of QDL-1, HTPB Polymer and 19% Aluminum. The Orion 50 stages are 1.28 meters in diameter with the 50ST version measuring 8.52 meters in length and holding 12,157 Kilograms of propellant and the 50S XLT variant standing 9.93 meters tall and holding an additional three metric tons of propellants. The XLT version debuted in 2004 and has flown successfully on three Taurus XL missions despite two of those failing at later flight stages. The Orion 50T and 50XLT versions are employed as the second stages of the Pegasus/Pegasus XL and Minotaur-C/Minotaur-C XL launch vehicles. A difference between the Pegasus and Minotaur versions are slightly enhanced skirts used on the ground-launched Minotaur vehicle. All versions share the booster family’s common diameter of 1.28 meters (50.2in). The baseline version of the Orion 50T stands 2.6 meters tall and holds 3,025 Kilograms of propellants burned in 75 seconds to deliver an average thrust of 115 Kilonewtons, peaking at 131.5 kN. In the XL version, the stage is stretched by 45 centimeters to hold an additional 900 kg of propellants which yields an increased average thrust of 158 kN with a maximum at 194 kN. Both versions host an electro-mechanical thrust vector control system for pitch and yaw control while a cold gas reaction control system on one of the upper stages assists in roll control. Per the typical Minotaur-C flight profile, the vehicle burns the first three stages in close succession and enters a coast phase after burnout of the second Orion 50 motor so that the fourth stage (formally called Stage 3) can accomplish a circular orbit injection. Depending on mission requirements, Minotaur-C can be fitted with an Orion 38 or Star 37FM as fourth stage (formally called Stage 3). The standard Minotaur-C fourth stage is Orion 38, a commercial solid rocket motor of Orbital ATK originally developed as the third stage of the Pegasus launch vehicle. For typical missions, Orion 38 is in charge of injecting the payload into orbit, typically completing a circular injection via energy management. Orion 38 is a low-cost, high-performance upper stage that finds applications on the Pegasus, Taurus and Minotaur families. It is 1.34 meters in length and 0.97 meters in diameter with a launch mass of 873 Kilograms. The Orion 38 holds 770 Kilograms of HTPB-based propellant within a composite engine casing, operating at a pressure of 45.5 bar to create an average thrust of 32.7 Kilonewtons, peaking at 36.9 Kilonewtons. The Star 37 Solid Rocket Motor was originally developed by Alliant Techsystems and is the predecessor to Star 48. Star 37 is available in a spin-stabilized (FM) version originally developed in the 1980s as an apogee kick motor for high-orbiting satellites and as third stage for the Delta II launch vehicle; a three-axis stabilized version (Star 37FMV) is available for missions that require three-axis stabilization but reduces performance due to the additional mass of the thrust vector control equipment. Star 37 FM weighs 1,148 Kilograms including 1,066kg of TP-H-3340 propellant, but the propellant load can be slightly adjusted based on payload and insertion requirements. It is 0.93 meters in diameter and 1.69 meters long featuring a Nozzle Assembly that uses a 3D carbon-carbon throat and a carbon-phenolic exit cone. Star 37 provides 47.3 Kilonewtons of average thrust and 54.8kN of peak thrust. 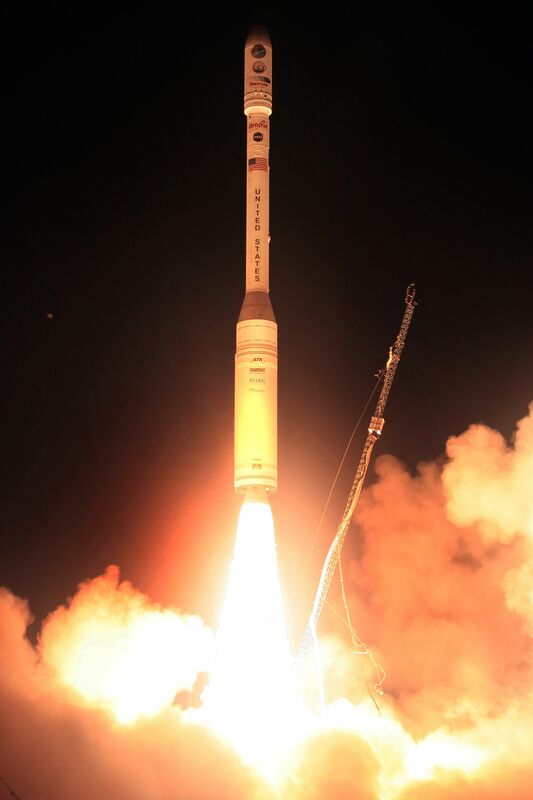 Spin-up of the Star 37FM to its operational 60 RPM is accomplished using Star 3 Solid Rocket Motors. Star 3 is 28.9 centimeters long and 8.1 cm in diameter, holding 480 grams of solid propellant that is expended during a 0.62-second burn at a thrust of 1.93 Kilonewtons. De-Spin of the upper stage after the completion of its burn is accomplished through a Yo-Yo De-Spin system. An additional Star 37 can be added to the Minotaur-C rocket for high-energy injection missions. 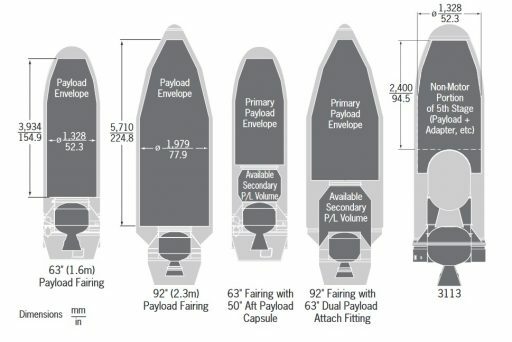 Minotaur-C can be flown with two flight-proven payload fairing versions to accommodate a variety of payload sizes including multi-payload stacks. 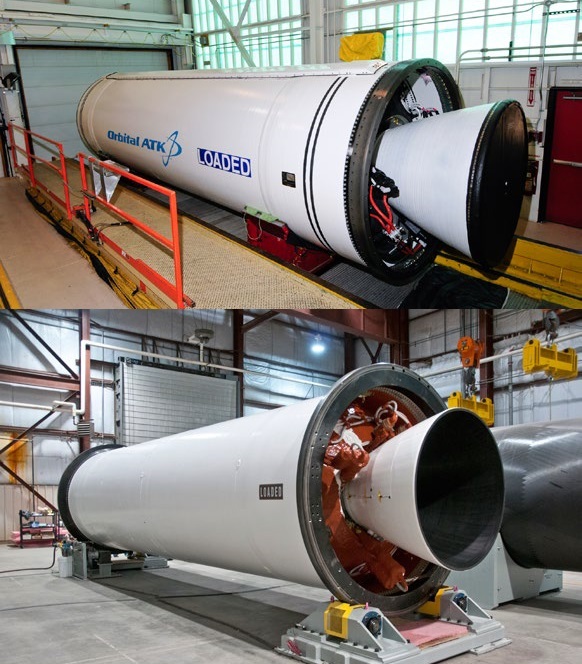 On offer is the standard 63-inch Taurus-type fairing and a larger 92-inch fairing from the Minotaur IV rocket family. The 63in payload fairing was implicated in the 2009 and 2011 failures of the Taurus rocket, failing to separate on the OCO and Glory missions. Analysis into the first failure revealed a list of four potential causes and Orbital re-designed the fairing according to recommendations made after the mishap; however, the original problem was overlooked and occurred again on the 2011 mission. After that, it was revealed that the contractor for the payload fairing system used parts from a subcontractor that were not built to aerospace requirements. With the transition to Minotaur-C, both contractors involved in the failed mission were replaced and components were verified to be up to the standards required in space flight. The fairings consist of two composite shell halves, a low-shock frangible rail and ring separation system, and an actuator/hinge fairing jettison system. The fairing structure is a aluminum honeycomb core covered by layers of graphic epoxy composite. The fairing is outfitted with acoustic blankets, a ventilation system and RF windows if required. The fairing also provides access doors to the payloads. The two fairing halves are joined by a frangible rail joint and the PLF is connected to the second stage using a ring-shaped frangible joint. Minotaur can support a number of Payload Adapter Modules including off-the-shelf adapters and custom built devices. Payload Adapters interface with the launch vehicle and the payload and are the only attachment point of the payload on the Launcher. 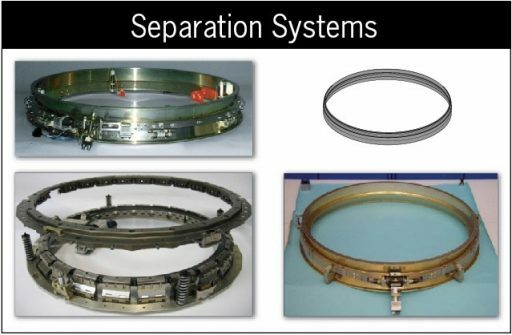 They provide equipment needed for spacecraft separation and connections for communications between the Upper Stage and the Payload. A typical PAM consists of a Payload Adapter Fitting that is connected to the upper stage, a payload cone and a separation system. Minotaur can facilitate Orbital-built as well as Planetary Systems and RUAG Space payload attach systems. Minotaur-C, as a change from the former Taurus design, implements a Common Avionics Assembly that is used across the Minotaur family. The CAA is a ring structure that is mounted on the upper stage of the vehicle offering space for the various avionics boxes that comprise the assembly. The Central Flight Computer of the Minotaur is based on Orbital’s Modular Avionics Control Hardware (MACH) that provides power transfer, data acquisition, booster interfaces, and ordnance initiation. Up to 10 MACH devices can be combined to satisfy mission requirements. Minotaur’ flight computer uses a 32-bit multiprocessor architecture and a RS-422 serial bus for data connections to avionics and payload systems. Additionally, the avionics assembly includes the Booster MACH, the Booster Control Module that provides actuator commands to the Thrust Vector Control Systems of the lower stages, the S- and C-Band Communications System that is used for telemetry downlink, Flight Termination System receivers and equipment, a GPS beacon and a vehicle encoder. Minotaur-C uses an improved telemetry system for real time data downlink up to 2Mbps with channels reserved for payload use. The Common Avionics Assembly gathers navigation data using an inertial platform that feeds the digital autopilot of the vehicle. The three-axis autopilot is programmed to fly a pre-programmed attitude profile during Stages 0 and 1 flight and gather navigation data which is then used to optimize the trajectory during the Stage 2 and 3 (& optional Star 37) burns. The two upper stages use a pre-defined set of parameters for their target trajectory which they use to modify their flight profile based on actual achieved trajectory by the lower stages.